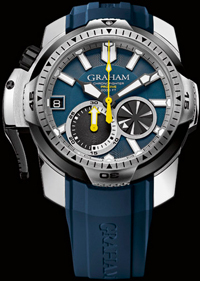 Based in London, the watch company Graham announced a new model Chronofighter Prodive, positioning as a professional diving instrument. Novelty is presented in three versions Chronofighter Prodive Professional (Ref. 2CDAV.B01A), Chronofighter Prodive Black (Ref. 2CDAV.B02A) and Chronofighter Prodive Blue (Ref. 2CDAV.U01A). Possessing exceptional water resistance to 600 meters, the novelty lies in the body with a diameter of 45 mm stainless steel. The model is equipped with a patented system of start / stop and reset, which allows to use the clock for indexing time during the dive. Corporate leverage Graham, protecting the crown from damage and automatic helium valve mounted on the left side of the body, which facilitates the use of them in extreme situations even being in the thick diving gloves made of neoprene. Building is equipped with a unidirectional rotating bezel with scalloped edges in 120 clicks and diving markup. The face of the building is equipped with a convex sapphire crystal with double anti-reflective coating. The steel case back is engraved image of a shark model and serial number. Black or blue dial model is equipped with an indicator chronograph function between 6 and 8 marks, subsidiary second dial in the form of the propeller between labels 3 and 5. Date built in a square aperture in the 9 o’clock position. Indexing time carried out by the central hour and minute arrows covered with white luminescent substance Super-LumiNova. Hour indices also fluoresce in the dark white and chronograph seconds and covered with yellow fluorescent indicator composition. New functions on the basis of the manufacturing machinery G1734 with a carrying frequency of 28 800 vibrations per hour, collected by 25 stones, a unique mechanism provides a 48-hour power reserve and is equipped with anti-shock system Incabloc. Model is equipped with integrated in the rubber bands of yellow, black and blue with steel buckles. Buy watches Chronofighter Prodive Professional (Ref. 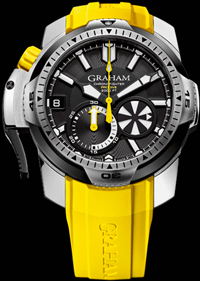 2CDAV.B01A) is possible through official representatives of Graham the price of 13 500 Swiss francs, and the model Chronofighter Prodive Black (Ref. 2CDAV.B02A) and Chronofighter Prodive Blue (Ref. 2CDAV.U01A) at a price 11,500 Swiss francs.